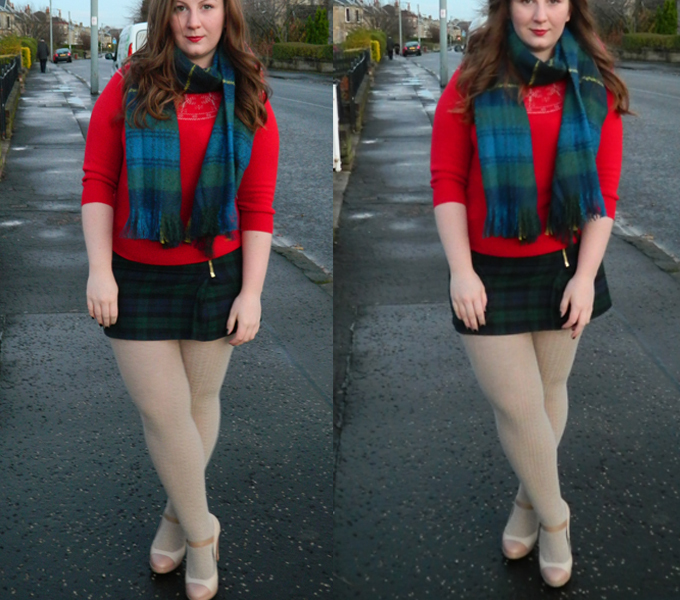 Tights - Last winter, and I think they were either Topshop or Walford, not 100% sure! So it's only November but I'm wearing a Christmas jumper. Being blantently honest I've been in full Christmas spirit since, oh, 3 months ago and I've put off my Christmas jumpers till now, so I think I've been quite restrained! I bought the one in the outfit and this one but I'm sure I'll be buying more before the year is out. The Blogger Christmas Party is drawing e'er nearer and there's a Best Christmas Party Dress/Worst Christmas Jumper dress code, so I'll be looking for something ridiculously bright and offensive for that, then secretly (or maybe not so secretly) actually loving it. This gorgeous scarf is from Next and I got it in the goody bag at this event - it is literally the snuggliest scarf in existence, as soon as I put it on I feel instantly cosy and warm. It's also really wide and could be used as a big wrap - so extra points there! The tights were ones I bought last winter and I absolutely love them - they really are lovely and warm and warmer than some of the pairs of jeans I own. I can't remember 100% where I actually bought these but I've noticed similar ones in H&M this year so I'll probably be stocking up on those ones too. This outfit is genuienly really lovely and warm and this winter I'm definitely trying to keep warm without giving in to wearing UGGs every single day. Cards on the table, they've been on a lot - but I am trying to branch out, so if you have any winter dressing with style posts or ideas link me to them! Love your jumper so much, such a gorgeous colour! Cute outfit :-) haha I'll need to go on a hunt them for a loud xmas jumper for the party! oooh la la lovely look!! totally cute! love the skirt!